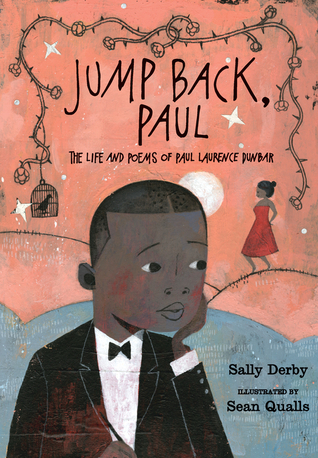 Jump Back Paul: The Life and Poems of Paul Laurence Dunbar by Sally Derby, illustrated by Sean Qualls. Grades 4-7. Candlewick Press, September 2015. 128 pages. Reviewed from ARC provided by publisher. Paul Laurence Dunbar was a poet. Now, when you think about poetry, you might think about strict rules for rhymes, for the number of syllables you have. You probably think about something that doesn't really sound like something anyone would actually ever just SAY or THINK. That's where Paul's poetry was different. He wrote the way people actually talked. And his poems were not meant for you to sit quietly and read and study, they were meant to be PERFORMED! In fact, if you sit down and look at one of Paul's poems, you might find that the words look strange - they're not spelled right, they sometimes don't look like words at all. But if you read it exactly as the letters spell out, you'll see that it sounds like someone just talking, the way people actually spoke. Paul's poems captured a way of life, reading them is like getting a look back in time to how things were in his day. This book includes many of his poems, bringing a little bit of Paul's world to life. His father was born into slavery and escaped on the Underground Railroad. He left when Paul was a little boy and his mother worked night and day to support herself and her young children. This is a great book for anyone who likes to learn about real people in history or who has a love of words like Paul Dunbar did. Told in a conversational tone, this biography of Paul Laurence Dunbar is fascinating. I knew absolutely nothing about him when I picked up this book and had never read any of his poetry (although I did find that I was a little familiar with some of it once I started reading). The tone of the book makes for a really pleasant reading experience, like you're sitting down with your grandmother who's telling you about this interesting man she knows. That same conversational tone can be a little tricky when it comes to nonfiction. There are several places where the author says "I imagine Paul felt like this..." or similar, which I'm not sure really can be grounded in historical fact. However, it didn't bother me enough to truly detract from the book. I imagine that the audiobook of this title, narrated by one of my favorites Bahni Turpin, will be amazing. Many of the poems included in the book are written in dialect and all the poetry in the book lends itself to being read aloud. Back matter includes a timeline, source notes, and a selected bibliography. If for nothing else than exposing kids to Dunbar's poetry and life, this is a very worthy addition to library and classroom shelves. I am looking forward to sharing it in booktalks this year! Those looking for more biographies of wordsmiths might enjoy Enormous Smallness: A Story of E.E. Cummings by Matthew Burgess or The Right Word: Roget and His Thesaurus by Jennifer Bryant. For those interested in the lives of African Americans after the Civil War, I would suggest The Amazing Age of John Roy Lynch by Chris Barton or (fictional) Elijah of Buxton by Christopher Paul Curtis.